Yarrow herb is a native plant to many areas of Asia, North America, and Europe. It is known by many other names including bloodwort, milfoil (or knights milfoil), and old man’s pepper. It is used in many herbal remedies and is believed to have wide ranging health benefits. Yarrow has been used for medicinal purposes as far back as 3000 years ago when the leaves were made into a tea. In ancient times, toothache was eased by chewing on the fresh leaves. The leaves were used on wounds to stop bleeding and were even used to help circulation problems. Helping to ease gastrointestinal problems due to the chemicals found in yarrow. It is believed they help to ease muscle spasms. The herb has high anti-inflammatory properties. Yarrow tea can help to reduce fever by increasing the body’s production of sweat, which also helps to remove toxins from the body. 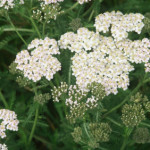 Yarrow tincture can ease the discomfort of hemorrhoids. Yarrow uses also include relieving excessive gas and bloating as well as easing the pain of menstrual cramps. Yarrow herb is a diuretic so can ease the effects of water retention. The herb also has antibiotic and astringent properties. Similar to chamomile, yarrow has a sedative effect, so drinking the tea can aid a restful sleep or help relax the body after a stressful or busy day. Yarrow is believed to be able to help regulate blood pressure and have a positive effect on cardiovascular issues. Yarrow helps to purify the blood and is good for improving the appetite of those who may be recovering from illness. Yarrow is an excellent supplement to take when suffering from colds and flu. As already stated, it can help to break a fever but can also give relief from coughs, helps to clear the respiratory system, thus helping to ease chest infections. In this instance, it may also be beneficial to those persons suffering from asthma. Yarrow tincture can help improve the digestive system and so ease symptoms and frequency of bouts of diarrhea. It may be useful to those persons prone to irritable bowel syndrome. A yarrow poultice is very good for healing skin problems such as burns, cuts and bruises. It is also know to reduce swelling, and warm yarrow tea can be used as a wash for skin problems like eczema and psoriasis. It is also thought to help sufferers of hay fever. Yarrow herb can be used in tinctures and infusions, which can be bought as ready-made tea or made from fresh yarrow leaves. It is also available as yarrow essential oil. There are no known side effects to using the yarrow herb, but, as always, exercise caution when taking supplements. If unsure, consult with a medical practitioner for advice before use, particularly if pregnant or already taking medications for health issues.